BAINBRIDGE ISLAND, Wash. — You've probably seen this balloon covered bus stop sign on Bainbridge Island. Ever wonder who does it? Turns out, he's a real clown. His name is Jerry Brader, aka Majick the Clown. He says the pole is the best advertisement he has because it makes people happy. Jerry can't see his work very well anymore, he lost most of his vision due to chicken pox. But others see it. "Everybody really likes 'em, when I'm down there blowing them up you'll hear people beeping their horns and stuff." "From busking at Pike Place Market I would keep all my old balloons and I was tying them around my bus stop." The pole became a local landmark, brightening everyone's way. Until Jerry had some heart trouble. "When I had my big surgery 7 years ago, I didn't do any balloonin' for 3 years." "I just had a thoracic aortic aneurysm done last year, that was a 15- inch stent so I basically have no aorta anymore." In the hospital with a life-threatening condition, Jerry stoically faced his mortality -- with plenty of balloons. 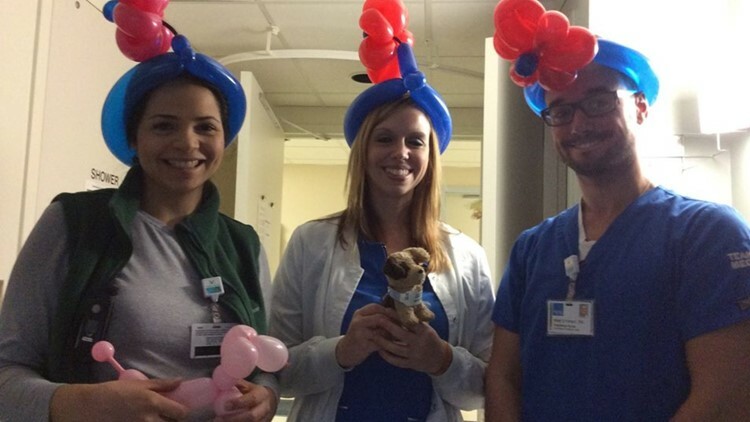 His Facebook page is loaded with shots of hospital staffers wearing balloon crowns – and smiles. Jerry faced his mortality ... with balloons. Now, blowing up the long skinny balloons is Jerry’s physical therapy. “My wind is really bad, my circulation, but the ballooning really helps with that, you know, it keeps working the lungs and all the muscles with the lungs and stuff." He puts one balloon heart on his pole, and it’s too fragile – it pops. Then he replaces it with another, one that will stay there for days. "My cardiologist says I've got a good heart too. The rest of the plumbing's kinda shabby -- it's all been replaced!” Brader laughed. He knows his heart’s both fragile and strong enough to make strangers smile. And that’s why Brader keeps coming back to the bus stop with more balloons.